The only thing worse than not taking your umbrella on a day when rain is expected is losing it. 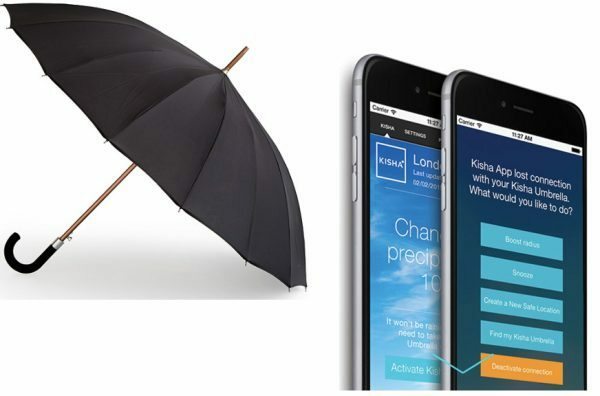 You won’t have to worry about either event with the Bluetooth Never Lost Umbrella by Kisha. The umbrella is 100% windproof and corrosion-proof. It has 16 ribs and a “perfect opening and closing mechanism”. Pair it with the smartphone app, and it will alert you to take it on days with precipitation predicted, and it will alert you before you walk off and leave it behind. If you do manage to lose it, you can track its location using the app and the umbrella’s built-in GPS. Uncommon Goods calls the umbrella the Bluetooth Never Lost Umbrella; it’s available only in plain black there for $80. The Kisha website offers classic and frilly versions in different fabric patterns for $100-$130. When an umbrella can say “yoohoo, you’ll need me today so don’t forget me!”, then I’ll buy one. This one does, check their website.